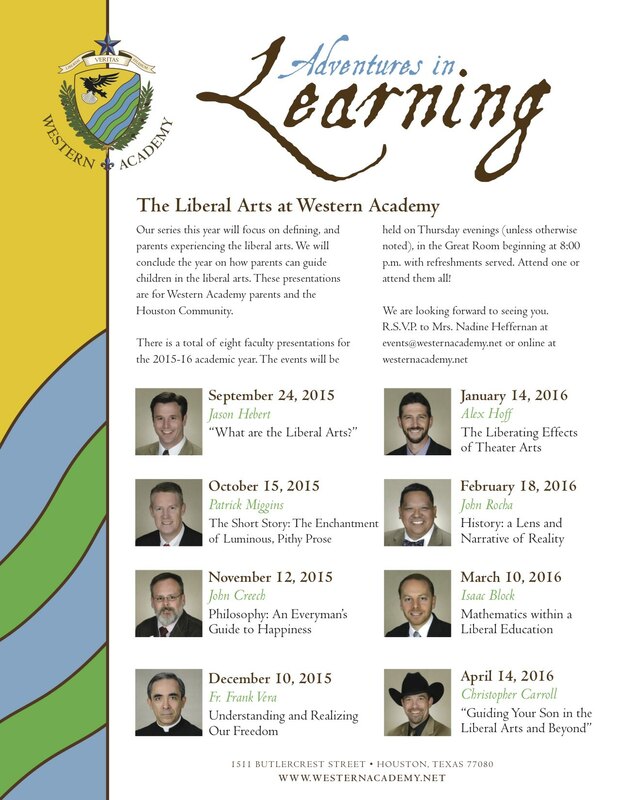 Adventures in Learning 1 Recap: What are the Liberal Arts? | Libertas. Veritas. Studium. Adventures in Learning 1 Recap: What are the Liberal Arts? Last Thursday evening, thirty-one people gathered together to hear our Headmaster, Jason Hebert, give a talk entitled, “What are the Liberal Arts?”, kicking off our Adventures in Learning series. Those assembled learned that the Liberal Arts are such that they are not merely to direct a man that he may do but that he may be. Jason showed that each of the Liberal Arts, be they philosophy, literature, history, mathematics, science, or music are all slivers of that Reality beckoning man to strive for the perfection, for which, he was created. If you were unable to join us, you can hear the audio recordings from the talk here. If you want to hear more, the series will continue monthly through the school year. Our next talk entitled, “The Short Story: The Enchantment of Luminous, Pithy Prose,” will be given by our Assistant Headmaster, Pat Miggins on October 15, 8:00pm-9:30pm. Please RSVP today!